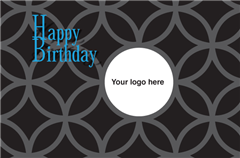 Have you ever thought of what a great marketing tool it would be to send Birthday Cards to your business associates. This Greeting Card allows you to put your logo on the front. Imagine how impressed your business associates would be getting a Birthday Card in support of The Childrens Wish Foundation of Canada.